The Connectors provide synchronisation at the entity level, where an entity is defined as having a unique identifier (a URI) and a set of properties and property values. In terms of RDF, this corresponds to a set of triples that have the same subject. In addition to simple properties (defined by a single triple), the Connectors support property chains. A property chain is defined as a sequence of triples where each triple’s object is the subject of the following triple. This version of the Lucene GraphDB Connector uses Lucene version 6.5.x. Go to Setup -> Connectors. Click the New Connector button in the tab of the respective Connector type you want to create. Fill in the configuration form. Execute the CREATE statement from the form by clicking OK. Alternatively, you can view its SPARQL query by clicking View SPARQL Query, and then copy it to execute it manually or integrate it in automation scripts. The "types" key defines the RDF type of the entities to synchronise and, in the example, it is only entities of the type http://www.ontotext.com/example/wine#Wine (and its subtypes). The "fields" key defines the mapping from RDF to Lucene. The basic building block is the property chain, i.e., a sequence of RDF properties where the object of each property is the subject of the following property. In the example, three bits of information are mapped - the grape the wines are made of, sugar content, and year. Each chain is assigned a short and convenient field name: “grape”, “sugar”, and “year”. The field names are later used in the queries. Grape is an example of a property chain composed of more than one property. First, we take the wine’s madeFromGrape property, the object of which is an instance of the type Grape, and then we take the rdfs:label of this instance. Sugar and year are both composed of a single property that links the value directly to the wine. The fields sugar and year contain discrete values, such as medium, dry, 2012, 2013, and thus it is best to specify the option analyzed: false as well. See analyzed in Defining fields for more information. Existing Connector instances show under Existing connectors (below the New Connector button). Click the name of an instance to view its configuration and SPARQL query, or click the repair / delete icons to perform these operations. ?cntUri is bound to the prefixed URI of the connector instance that was used during creation, e.g., http://www.ontotext.com/connectors/lucene/instance#my_index>, while ?cntStr is bound to a string, representing the part after the prefix, e.g., "my_index". From the user point of view, all synchronisation happens transparently without using any additional predicates or naming a specific store explicitly, i.e., you must simply execute standard SPARQL INSERT/DELETE queries. This is achieved by intercepting all changes in the plugin and determining which abstract documents need to be updated. The result binds ?entity to the two wines made from grapes that have “cabernet” in their name, namely :Yoyowine and :Franvino. You must use the field names you chose when you created the connector instance. They can be identical to the property URIs but you must escape any special characters according to what Lucene expects. :Franvino is returned twice because it is made from two different grapes, both of which are returned. If you join the entity from the connector query to other triples stored in GraphDB, GraphDB might scramble the order. To remedy this, use ORDER BY from SPARQL. Sorting by an analysed textual field works but might produce unexpected results. Analysed textual fields are composed of tokens and sorting uses the least (in the lexicographical sense) token. For example, “North America” will be sorted before “Europe” because the token “america” is lexicographically smaller than the token “europe”. If you need to sort by a textual field and still do full-text search on it, it is best to create a copy of the field with the setting "analyzed": false. For more information, see Copy fields. Unlike Lucene 4, which was used in GraphDB 6.x, Lucene 5 imposes an additional requirement on fields used for sorting. They must be defined with multivalued = false. The specific order in which GraphDB returns the results depends on how Lucene returns the matches, unless sorting is specified. The actual snippets might be different as this depends on the specific Lucene implementation. :snippetSpanClose - text to insert after the highlighted text, </em> by default. See Multiple property chains per field for defining a field whose values are populated from more than one property chain. See Indexing language tags for defining a field whose values are populated with the language tags of literals. See Indexing the URI of an entity for defining a field whose values are populated with the URI of the indexed entity. This option corresponds to Lucene’s field option "indexed". This options corresponds to Lucene’s property "stored". This option corresponds to Lucene’s property “tokenized”. Lucene needs to index data in a special way, if it will be used for faceted search. This is controlled by the Boolean option “facet”. True by default. Fields that are not synchronised for faceting are also not available for faceted search. By default, the Lucene GraphDB Connector uses datatype of literal values to determine how they must be mapped to Lucene types. For more information on the supported datatypes, see Datatype mapping. The snippet creates an analysed field “grape” and a non-analysed field “grapeFacet”, both fields are populated with the same values and “grapeFacet” is defined as a copy field that refers to the field “facet”. The connector handles copy fields in a more optimal way than specifying a field with exactly the same property chain as another field. Sometimes, you have to work with data models that define the same concept (in terms of what you want to index in Lucene) with more than one property chain, e.g., the concept of “name” could be defined as a single canonical name, multiple historical names and some unofficial names. If you want to index these together as a single field in Lucene you can define this as a multiple property chains field. The values of the fields name/1 and name/2 will be merged and synchronised to the field name in Lucene. You cannot mix suffixed and unsuffixed fields with the same same, e.g., if you defined myField/new and myField/old you cannot have a field called just myField. Virtual fields are specified with the suffix, e.g., ?myField/2 or ?myField/alt. Physical fields cannot be combined with parent() as their values come from different property chains. If you really need to filter the same parent level, you can rewrite parent(?myField) in (<urn:x>, <urn:y>) as parent(?myField/1) in (<urn:x>, <urn:y>) || parent(?myField/2) in (<urn:x>, <urn:y>) || parent(?myField/3) ... and surround it with parentheses if it is a part of a bigger expression. 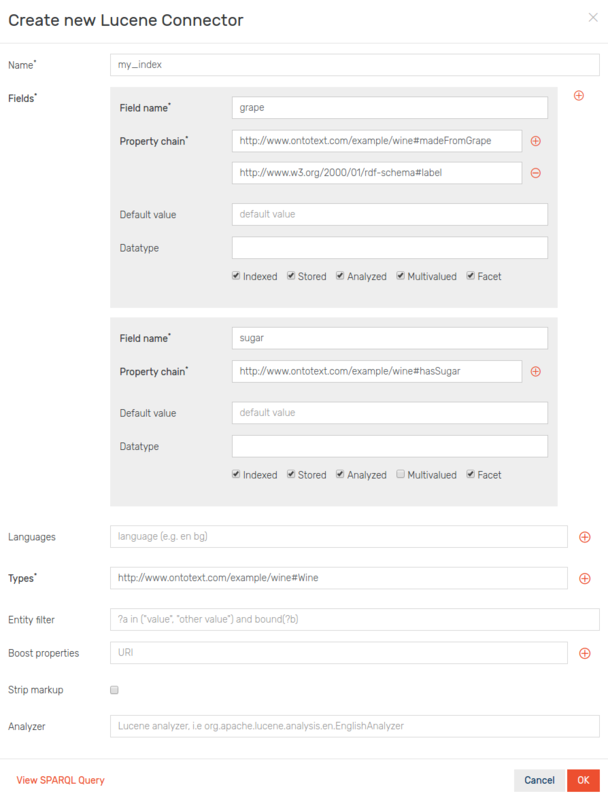 The above connector will index the language tag of each literal value of the property http://www.ontotext.com/example#name into the field nameLanguage. The above connector will index the URI of each wine into the field entityId. For any given field the automatic mapping uses the first value it sees. This works fine for clean datasets but might lead to problems, if your dataset has non-normalised data, e.g., the first value has no datatype but other values have. The construction parent(?var) is used for going to a previous level in a property chain. It can be applied recursively as many times as needed, e.g., parent(parent(parent(?var))) goes back in the chain three times. The effective value of parent(?var) can be used with the in or not in operator like this: parent(?company) in (<urn:a>, <urn:b>), or in the bound operator like this: parent(bound(?var)). The construction ?var -> uri (alternatively, ?var o uri or just ?var uri) is used for accessing additional values that are accessible through the property uri. In essence, this construction corresponds to the triple pattern value uri ?effectiveValue, where ?value is a value bound by the field var. The effective value of ?var -> uri can be used with the in or not in operator like this: ?company -> rdf:type in (<urn:c>, <urn:d>). It can be combined with parent() like this: parent(?company) -> rdf:type in (<urn:c>, <urn:d>). The same construction can be applied to the bound operator like this: bound(?company -> <urn:hasBranch>), or even combined with parent() like this: bound(parent(?company) -> <urn:hasGroup>). The URI parameter can be a full URI within < > or the special string rdf:type (alternatively, just type), which will be expanded to http://www.w3.org/1999/02/22-rdf-syntax-ns#type. The construction graph(?var) is used for accessing the RDF graph of a field’s value. 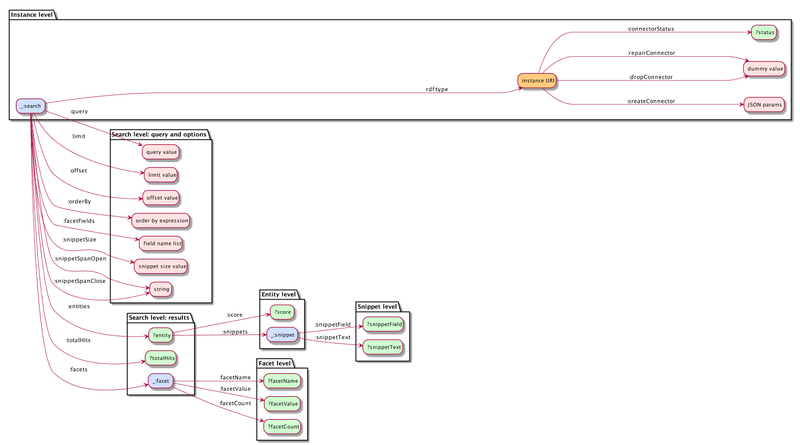 The typical use case is to sync only explicit values: graph(?a) not in (<http://www.ontotext.com/implicit>). The construction can be combined with parent() like this: graph(parent(?a)) in (<urn:a>). The construction lang(?var) is used for accessing the language tag of field’s value (only RDF literals can have a language tag). The typical use case is to sync only values written in a given language: lang(?a) in ("de", "it", "no"). The construction can be combined with parent() and an element beyond the chain like this: lang(parent(?a) -> <http://www.w3.org/2000/01/rdf-schema#label>) in ("en", "bg"). Literal values without language tags can be filtered by using an empty tag: "". The default value is used for the entity :beta as it has no value for city in the repository. As the value is “London”, the entity is synchronised. && ?taggedWithLocation type in (<http://www.ontotext.com/example2#Location>)"
type is the short way to write <http://www.w3.org/1999/02/22-rdf-syntax-ns#type>. :Article1 :Einstein :Berlin :taggedWith has the values :Einstein, :Berlin and :Cannes-FF. The filter leaves only the correct values in the respective fields. The value :Cannes-FF is ignored as it does not match the filter. :Article2 :Berlin :taggedWith has the value :Berlin. After the filter is applied, only taggedWithLocation is populated. :Article4 :Mozart :Berlin :taggedWith has the values :Berlin and :Mozart. The filter leaves only the correct values in the respective fields. :Article5 :taggedWith has no values. The filter is not relevant. :Article6 :taggedWith has the value :Cannes-FF. The filter removes it as it does not match. 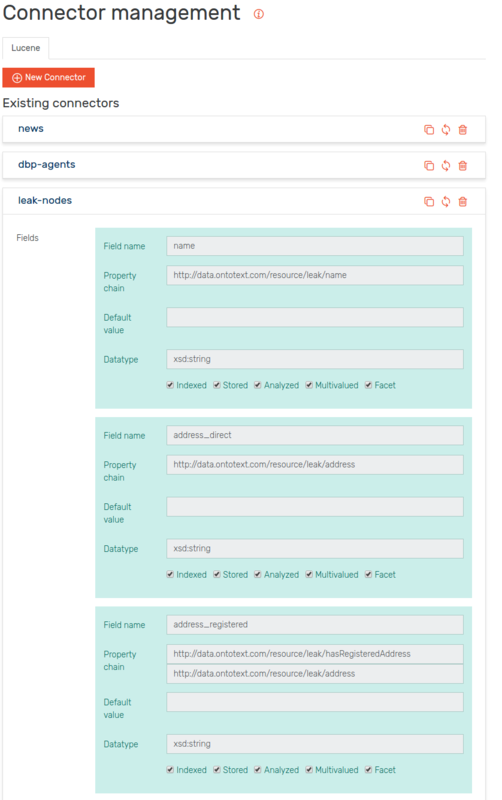 There are no new connector options in GraphDB 7. Fields used for sorting (orderBy predicate) need to be declared with multivalued = false now. If you use orderBy you have to recreate your connector instances. We recommend to drop any existing instances and recreate them to benefit from any performance improvements in Lucene 5.x even if you do not have any orderBy’s in your queries. Backup the INSERT statement used to create the connector instance. Deploy the new GraphDB version. Modify the INSERT statement according to the changes described below. The current version always produces a single Lucene field per field definition in the configuration. This means that you have to create all appropriate fields based on your needs. See more in List of creation parameters. To mimic the functionality of the old _sort_fieldName fields, you can either create a non-analysed Copy fields (for textual fields) or just use the normal field (for non-textual fields).